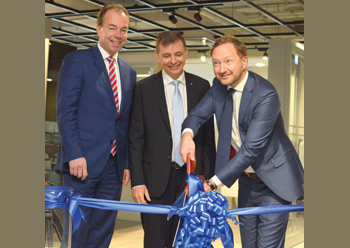 The deputy Swiss ambassador cuts the ribbon to open the new Geberit information centre, alongside key Geberit officials. Deputy Swiss ambassador to the UAE Vincent Pasquier cut the ribbon alongside Ronald van Triest, member of the Geberit Group Executive Board and head of Sales Division International and Andre Winogradsky, managing director Head of Gulf amongst other senior Geberit management. Among the guests were designers, architects, developers, consultants and contractors who were able to experience Geberit products first-hand. Geberit showcased all its competences from supply pipes, drainage pipes and all ranges of Geberit-branded bathroom ceramics including the soon-to-be-launched Acanto bathroom series. The Acanto series offers everything that is desired of bathrooms nowadays in terms of solutions, says Louise Pitt of Geberit. “The furniture and ceramic sanitary appliances have a timeless design and are individually combinable, and these include a wide range of washbasins, rimless Rimfree toilets, bidets and bathtubs. The ceramic sanitary appliances impress, thanks to their soft organic shapes in combination with straight lines,” she added. The new Geberit information centre ... inaugurated last month. With the Geberit Acanto bathroom series, Geberit is focusing on the mid segment of the market for private and semi-public areas. Geberit Acanto will be available from April 2018. The series includes standard washbasins with various projections, both with or without a shelf surface, as well as pure vanity basins with a SlimRim design. Acanto comprises both wall-hung and floor-standing WCs (water closets) – all of which are rimless. The Geberit Rimfree WC ceramic appliances are more hygienic because all the areas are easy to clean, she pointed out. All models have a closed outer shape and hidden fastenings. The WC seats, which can be easily removed at the touch of a button with the optional QuickRelease function, also ensure greater cleaning comfort. Meanwhile, the furniture from the Geberit Acanto bathroom series can either be used as a stand-alone solution for the washbasin area (with washbasin, washbasin cabinet and mirror cabinet) or as a concept solution. With a concept solution, customers can combine the individual furniture types with one another according to their needs and the space on offer. “When designing the bathroom furniture, we combined different materials and surfaces such as glass, metal and painted and wood finishes with one another in order to create a unique, high-quality appearance,” said Sarah Seidel, the designer responsible for Geberit Acanto. Wall-hung WCs and bidets are quickly and safely installed with the Geberit fastening for wall-hung WCs and bidets EFF2 (Easy Fast Fix); while the fastening system EFF1 – available with the 90 cm and 120 cm Geberit Acanto washbasins – makes it easier to install larger washbasins by oneself. Headquartered in Rapperswil-Jona, Switzerland, the Geberit Group has more than 30 production facilities, of which six are located overseas.